The Big Day Out, an Australian franchise based on the successful Lollapalooza model, brought alternative, hard rock, hip hop and, more recently, dance acts together in a one-day festival in Auckland. 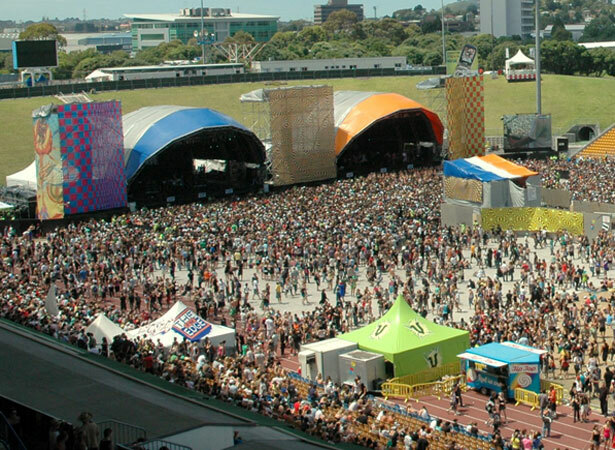 Around 8000 punters turned up to the first ‘BDO’ at Auckland’s Mt Smart Stadium to watch headliners Soundgarden, Smashing Pumpkins, and The Breeders, who arrived to play on a massive pageant float. Sharing the stage with these international acts were local favourites like Shihad and Straitjacket Fits. From there it only got bigger. Utilising the bulk of the Australian festivals’ overseas line-up, backed by a strong local bill, it proved a popular formula, regularly attracting crowds between 30,000 and 40,000 during the 2000s. These proved to be the festival’s peak years. Declining ticket sales saw New Zealand’s leg of the Big Day Out tour close in 2012. The festival returned to Auckland in 2014, although this turned out to be a false dawn for BDO diehards, with promoters soon announcing that the 2015 event was off. We have 2 biographies, 2 articles, related to First Big Day Out music festival in New Zealand .